We garden because we love to work around plants. Most plants need a little fussing to grow lush and healthy and bloom the way we want them to bloom. Gardeners go out of their way not to be too tough on their plants. However, it is possible to work your plants to death, by overdoing the very things we think they rely on us to deliver. There is such a thing as too much of a good thing and here are 3 examples. The normal reaction to a wilting plant is to give it some water, but ironically, wilting is also a symptom of overwatering. So if you’ve been watering your plants frequently and deeply or if you’ve gotten a lot of rain lately, think twice before you reach for the hose. More houseplants die from being over watered than from too little water, and outdoor plants are not spared that fate. If you think your plants are well watered and they still wilt and maybe start turning yellow or pale green, check the roots of a couple of plants. Roots need air, which is why we’re told to allow the soil to dry out between waterings. If the soil is always wet, no air can get in. That doesn't mean you want to leave them dry for a prolonged period, but you do not want the plant roots always sitting in wet soil, or they will rot. Healthy roots should look firm and smell clean. Most will be some shade of creamy white. Rotting roots will be dark and mushy, will an unpleasant odor. If the roots are too badly rotted, the plant may never recover, but most will rally, once you allow the soil to drain. In the meantime, it’s very important that you resist the urge to pamper the plant, while it’s ailing. Do not try to correct things with more fertilizer or pruning. Leave it alone. If you can, give it some shade for a week or two. Then let it rest and regroup on its own. The adage that if a little is good a lot must be better is rarely the case and fertilizing plants is no exception. There are some plants known as heavy feeders, but no plant needs to be feed every time you water. Excessive fertilizer effects plants in a couple of ways. If you are using synthetic fertilizer, the salts can build up in the soil and burn the roots. This is especially true of potted plants. 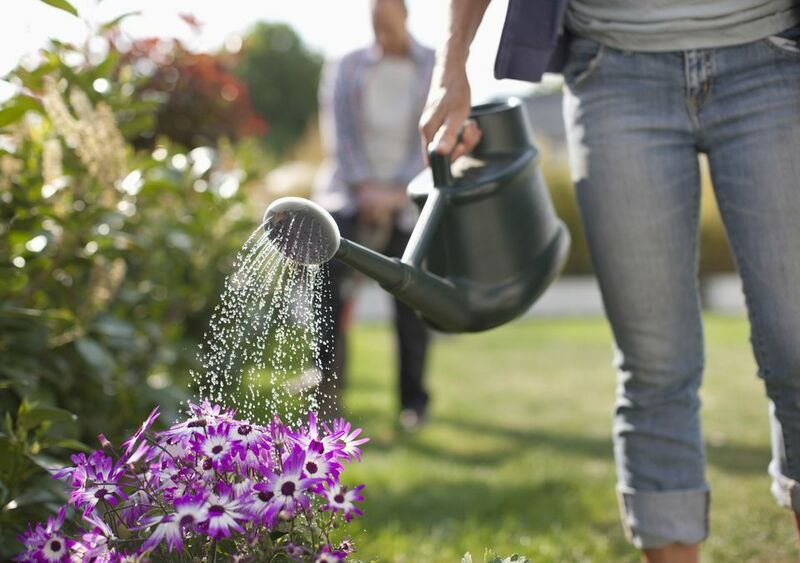 Make sure you water all your plants well enough to disperse the water and food and allow water to drain out of the drainage holes in your containers, to avoid salt built up. Too much fertilizer, especially food high in nitrogen (the first number on the package), can promote a lot of tender, leafy growth. That may sound like a good idea, but being forced into unnatural growth can stress a plant. Stressed plants, like stressed people, are more susceptible to disease. Also, stressed plants are very attractive to insect pests. They love tender, succulent growth. Don’t forget, most plants need a period of dormancy. Winter takes care of that for us outdoors, but indoor plants need to rest during the offseason. Don’t feed them until you start to see signs of new growth in the spring and cut back a little on watering. Mulch does many wonderful things in the garden, but once again, it can be too much of a good thing. Two - 4 inches of mulch will keep the soil cool, conserve moisture and help suppress weeds. More than that and you’re asking for trouble. Too much mulch can prevent water and air from getting to the soil. Water tends to drain off before it reaches the soil surface, let alone the plant roots and as I mentioned above, roots need air, too. A heavy layer of mulch blocks air flow and can also compact the soil. Mounding mulch too close to a plant’s stem or a tree’s trunk is another common mistake. This is a common practice of public landscapers. It even has a name - mulch volcanos. Besides leading to the two problems listed above, mulch volcanos offer safe harbor to insects, and they hold moisture next to the stem or trunk, with can lead to rotting or fungal diseases. Always keep mulch an inch or more away from the actual plant. Death by mulch is usually a slower process than overwatering, but if you think you’re doing everything else right and your plants still aren’t happy, check your mulch depth. Rake it out and make sure water can sink through and get where it needs to go. Every plant is different. Every garden is different. The best way to care for your plants is to keep a close eye on them and catch problems early. Luckily that means walking or working in your garden regularly, something we already do.